Copies of this report are available for $1.50 each, or 50 cents each for orders of 20 or more, from the Center for International Policy. Request copies by e-mail at cip@ciponline.org. This report is also available in Adobe Acrobat (.pdf) format (565 KB). In early September 2001, Congress was debating a number of national security issues involving Latin America, including the Bush Administration's new Andean counterdrug initiative and the continued U.S. military presence on the Puerto Rican island of Vieques. While still critically important in the region, both dropped to barely perceptible blips on Washington's political radar screen after September 11th. While U.S. military programs will continue in Latin America, they are likely to undergo some changes as the United States responds to the terrorist attacks. This year's major assistance package to Latin America focuses on U.S. military support for counternarcotics efforts in Colombia and the Andean region. While major guerrilla groups operate in Colombia, the United States has so far restricted its rationale for assistance to counter-drug support. In the wake of the terrorist attacks, the already blurry line between counternarcotics and counterinsurgency in Colombia may be erased. Human rights conditions on aid are also at risk as U.S. attention turns to terrorist threats. Efforts are underway to seek broad waiver authority to override human rights safeguards on U.S. military programs worldwide. Agreements with countries hosting U.S. military Forward Operating Locations in Latin America restrict their use to counterdrug activities, but there may be pressure to use these facilities for counterterrorism purposes as well. Beyond these potential changes, many of the programs the United States carries out with Latin American militaries will not be dramatically affected by recent events. Engagement is, and will continue to be, a primary objective for many U.S. military programs in the region. The other overriding rationale for U.S. military programs in this hemisphere has been counternarcotics, and these programs will certainly remain high priorities. Before September 11, congressional oversight of U.S. military programs with Latin America was limited, but steadily improving. Now, it is less likely that Congress will focus significant attention on the oversight of any programs outside of the terrorism response. While the shift in policymakers' attention is understandable, U.S. involvement in the Colombian counterdrug effort, the build up of the Forward Operating Locations and large scale training programs will all continue. Military-to-military activities and priorities will move forward, whether or not policymakers are minding the store. Public access to information about U.S. military assistance increased somewhat since 1997, when the Latin America Working Group launched the "Just the Facts" project. Congress required some new reports -- particularly an overall accounting of U.S. military training and a description of the Defense Department's counterdrug aid -- that gave much insight into U.S.-Latin American military cooperation. Since 2000, however, we have seen a disturbing reversal in this progress. The above-mentioned report on military training (known as the "Foreign Military Training Report," or FMTR) was released in March 2000 with key information from earlier reports classified. The 2000 FMTR would not identify the foreign military units trained, making impossible monitoring of compliance with human rights conditions in military-aid law. The report also removed any mention of U.S. trainers and training locations, leaving the public unable to determine which U.S. institutions (such as the former School of the Americas) provide the most instruction and how much training takes place overseas. 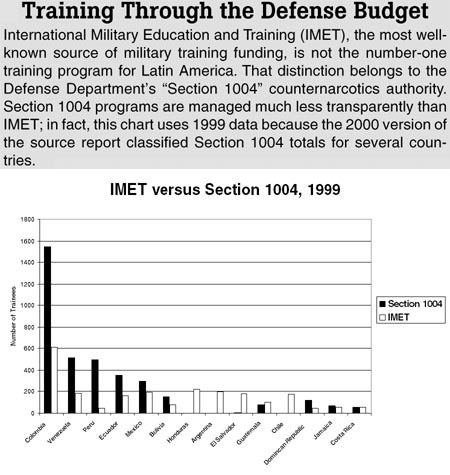 The 2001 FMTR increased classification still further, this time entirely cutting out much of the counter-drug training provided by the Defense Department -- one of the largest funding sources for military training in Latin America. As a result, the report left out even aggregate numbers of trainees for many Latin American countries. It became impossible even to answer basic questions like "how many Bolivians were trained in 2000," rendering the FMTR largely useless as an oversight tool. 2001 also saw another crucial tool severely weakened. All Latin America activities were for the first time removed from unclassified distributions of the Pentagon's annual report on Special Operations Forces' training with foreign forces (known as the "Section 2011" report due to its place in the U.S. Code). This report is the best source of information about the Special Forces' Joint Combined Exchange Training (JCET) program. JCET was a source of some controversy after 1998 press reports revealed the program was active in Indonesia, a country banned at the time from receiving military aid through the foreign assistance budget. Congressional committees considering 2002 legislation have called on the State and Defense departments to reconsider increased classification. 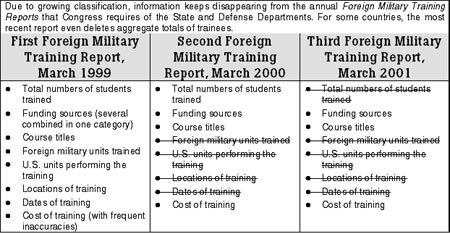 The Senate Appropriations Committee's non-binding report accompanying the 2002 foreign aid bill expects the next FMTR "to contain the maximum amount of information in declassified form, including information about foreign units trained; the location of training; U.S. trainers' units; course descriptions; the number of courses given and students trained; and estimates for next-year training in each category of training reported." The House version includes similar language. Referring to both the FMTR and the "Section 2011" report, the House Armed Services Commmittee's report accompanying the 2002 Defense Authorization bill notes that "information contained in these reports regarding foreign military units trained is important and should, where appropriate, be made available in an unclassified form to the general public." Legislation currently before the House of Representatives would make greater disclosure of training into law. The "Foreign Military Training Responsibility Act" (H.R. 1594) would also require a report on foreign police training, improve tracking of trainees' careers, and establish a commission to re-think the mission of foreign military training activities. Other forces in Congress are pushing in the opposite direction, seeking to weaken further the Foreign Military Training Report. Section 816 of the House of Representatives' version of the 2002-2003 Foreign Relations Authorization Act (H.R. 1646) would require the FMTR to be produced only at the request of congressional leaders, and only for specified countries. The House and Senate versions of the 2002 foreign aid bill continue reports, including the FMTR, and human rights conditions that applied to previous aid, while adding little new (other than those applying to Andean aid, discussed below). These conditions include prohibitions on combat and technical training to Guatemala through the International Military Education and Training (IMET) program. The Senate Appropriations Committee's report on the 2002 foreign aid bill notes that "the Committee is perplexed by the Administration's requests for regular IMET assistance for some countries whose armed forces have a recent history of actively undermining elected civilian authorities, corruption, and human rights abuses, and which have shown no commitment to reform." The same report includes language clarifying implementation of the Leahy Law, which since 1997 has prohibited aid to foreign military units that violate human rights with impunity. The subcommittee defines "unit" as "the smallest operational group in the field that has been implicated in the reported violation." The report also calls for the State Department "to establish and maintain an electronic database of credible evidence of gross violations of human rights by units of foreign security forces. Each U.S. embassy should designate an appropriate official to collect and submit data to the database from a wide range of sources on a regular basis. Such a database would be one important depository of evidence for making determinations regarding the implementation of this provision." This clarification was needed because interpretation and implementation of the law has varied even among U.S. embassies in Latin America. The largest element of the United States' 2002 plans for the hemisphere is continued support for "Plan Colombia," which began with the July 2000 passage of a $1.3 billion package of "emergency" anti-drug aid to Colombia and its neighbors. 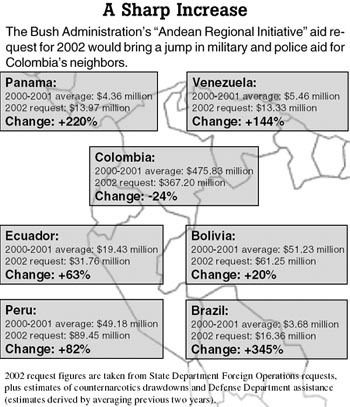 The Bush Administration's "Andean Regional Initiative" aid request will continue programs begun under the 2000 aid package, while greatly increasing military and police assistance to six of Colombia's neighbors. In dollar terms, the request seeks less aid to Colombia's military and police than Bogotá received in 2000 and 2001. This merely reflects that the 2002 request includes no high-cost helicopters, which added about $350 million to the 2000-2001 aid package. * The sixteen UH-60 Blackhawk and roughly forty UH-1 Huey helicopters in that package began delivery to Colombia in July 2001. They will provide mobility to a three-battalion Counternarcotics Brigade in Colombia's army, created with heavy U.S. assistance. The second and third battalions completed training by U.S. Special Forces in December 2000 and May 2001, respectively. The battalions are charged with guaranteeing security for an expanded program of aerial fumigation of drug crops, carried out by Colombia's National Police and U.S.-funded private contractors. 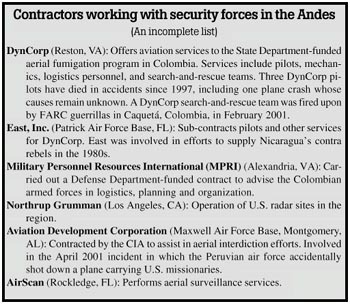 The U.S. government contracts with private companies, which employ civilians to work in Colombia as spray-plane pilots, mechanics, search-and-rescue personnel, military trainers, logistics experts and intelligence-gatherers, among other duties. The State Department reported in May 2001 that "the average number of U.S. citizen civilian contractors working on State Department, USAID and DOD programs supporting Plan Colombia on any given day has been in the range of 160-180 persons." According to press reports, including non-U.S. citizens increases this number to well over 300 civilian contractors. The heavy use of contractors has been a source of some controversy, as it raises issues of accountability and proximity to Colombia's conflict. The controversy was fed by the involvement of contract personnel in the accidental shooting down of a plane carrying U.S. missionaries, mistaken for drug traffickers, over Peru in April 2001. While the Andean Regional Initiative will slightly decrease military and police aid levels for Colombia in 2002, it will mean a large leap in this assistance to Colombia's neigbors. Peru's armed forces will enter the post-Fujimori period with new U.S. funding for Navy riverine efforts, Air Force C-26 sensor packages, engine upgrades, and training. The Peruvian police will get upgrades to fourteen UH-1 Huey helicopters and greater assistance for manual coca eradication programs. Securing Ecuador's border with Colombia will be the chief focus of U.S. security assitance to Quito. Assistance to Ecuador's military and police will include training, logistical support, communications gear and maintenance of helicopters and equipment. The United States is also in the midst of a $61.2 million upgrade to an airbase at Manta, on Ecuador's Pacific Coast. U.S. aircraft will use Manta as a "Forward Operating Location" to host and maintain surveillance flights over the drug "source zone" (particularly southern Colombia, Peru and Bolivia). The United States has built barracks for Bolivia's Army in the Chapare coca-growing region, and sent numerous teams of counter-drug military trainers. Plans for 2002 include equipment, weapons and training for the ground, water and air interdiction efforts of all branches of Bolivia's armed forces and police. Brazil's police will receive significant counternarcotics assistance for the first time in 2002. Much of it will support Brazil's "Operation Cobra," a three-year effort to fortify the border with Colombia. Securing the Colombian border is a central goal of U.S. police assistance in armyless Panama. Greatly increased aid will provide equipment, training and advice to Panamanian National Police border units, National Maritime Service, and National Air Service. U.S. military relations with the government of Venezuelan President Hugo Chávez have been mixed. Venezuela continues to prohibit use of its airspace by U.S. counter-drug surveillance aircraft, and the State Department has criticized Venezuela's own interdiction efforts as "largely unsuccessful." In August 2001, Venezuela revoked the fifty-year-old agreement granting the U.S. Military Group a rent-free presence in the Fuerte Tiuna military headquarters in Caracas. Venezuelan Defense Minister José Vicente Rangel criticized the agreement as "a museum piece of the Cold War." On the other hand, U.S. collaboration with Venezuela's National Guard continues to be close, particularly on counter-narcotics matters, and Venezuela's security forces will see a significant increase in U.S. funding in 2002 as part of the Andean Regional Initiative. U.S. aid to the Andes continues to receive more scrutiny than any other activity in the hemisphere. Colombia is particularly controversial. Concerns have centered on the human rights record of the world's third-largest recipient of security assistance (as of publication) and the possibility of entanglement in a broadening conflict. The Senate Appropriations Committee noted that "many Members have expressed concerns that this program is drawing the United States into a prolonged civil war that may pose grave risks to American personnel and further hardships for the Colombian people." The executive branch has long dismissed such concerns by insisting that U.S. aid is for counternarcotics programs, not counter-insurgency. However, the Bush Administration is carrying out a "formal review" to determine whether the U.S. mission should remain "just narcotics, or is there some wider stake we may have in the survival of a friendly democratic government," as Assistant Secretary of Defense for International Security Affairs Peter Rodman defined it in August 2001. Uncertainty about the direction of U.S. policy toward the Andes has led to the placement of several restrictions and reporting requirements on the 2002 Andean aid package, which as this document goes to press is currently before Congress as part of the Foreign Operations appropriation. Both houses' versions place human rights conditions on military assistance, and include maximum numbers of U.S. military personnel and contractors allowed in Colombia at any given time. The Senate's version would cut off aerial fumigation funding until the government certifies the chemicals' safety and use according to U.S. government and manufacturers' standards, and until reparation mechanisms are in effect for those unjustly fumigated. As this document goes to press in late September 2001, it is unclear how U.S. aid to the Andes will be affected by the September 11 terrorist attacks. A direct threat to U.S. security on its own soil may divert attention and resources -- including military aid -- away from the region. It is at least as likely, though, that a new global "war" on terrorism might ease a shift toward counter-insurgency assistance, with the pretext of helping Colombia to control the three armed groups in its country that appear on the State Department's list of thirty-one international terrorist organizations. The United States' relationship with Mexico's military continues to be based on counternarcotics. In 2001, the United States plans to train 1,363 Mexican military personnel. While training numbers have fluctuated somewhat over the past few years, the average remains around 1,000 per year. The fluctuations likely have more to do with temporary political considerations than with significant changes in priorities or direction. According to the 2000-2001 Foreign Military Training Report, "The U.S. conducts extensive training in the counter-narcotics area, with special focus in helicopter repair and maintenance of aircraft. Technical assistance covering a broad range of counter-drug capabilities and assets help enhance Mexico's ability to combat narcotic traffickers and continue its cooperation with U.S. counter-drug efforts." Aircraft training with Mexico began in earnest when the United States donated 73 used helicopters for counter-drug use in 1996 and 1997. Though Mexico returned all of the helicopters in 1999, the training program has continued; the Mexican military has obtained helicopters from other sources and standard helicopter training applies equally to the new equipment. While the annual Foreign Military Training Report has classified information about foreign units trained by the United States, it is clear that counternarcotics work has taken on more of a maritime focus, and that the United States is working closely with the "Marina" in Mexico. This same report appears to indicate an increase in training programs that take place on Mexican soil. Unlike the rest of Latin America, where U.S. mobile training teams and Special Operations Forces conduct much training in host countries, most Mexican trainees have been brought to the United States for training. The presence of U.S. troops in Mexican territory has been historically controversial. However, this year's FMTR indicates that about half of expected trainees for 2001 are taking courses either given by mobile training teams or courses often provided in that fashion. While off somewhat from 1996 and 1997, when the helicopters were transferred and significant resources went to training counter-drug Air Mobile Special Forces Groups (GAFEs), engagement with the Mexican military is still a major priority for the United States. While Department of Defense officials admit that the relationship has been rocky, one recently described the periodic crises as "on the margins of the fundamental relationship." While military and police aid levels to Central America lag behind the Andes and Mexico, they are no longer declining from their 1980s highs. El Salvador's security forces in particular are experiencing a significant jump in U.S. aid. Aid in dollar terms, which stayed below $1 million since the early 1990s, may reach nearly $4 million in 2002 thanks to a large infusion of Foreign Military Financing (FMF, the U.S. government's main non-counternarcotics military aid program). The State Department reports that the FMF will help the Salvadoran military refurbish helicopters overused in response to January 2001 earthquakes, and will support naval vessels used for drug interdiction. El Salvador is also hosting a Forward Operating Location at its Comalapa airport, where U.S. Navy and Customs personnel are supporting counter-drug surveillance aircraft on missions over the eastern Pacific Ocean. While the site is in limited use, improvements valued at $9.3 million will be made in 2002 and 2003. Counternarcotics assistance to Central America is increasing, though peacekeeping and humanitarian assistance continue to be key missions of U.S. military cooperation with the region. The Southern Command's Humanitarian and Civic Assistance (HCA) program, in which U.S. miltiary personnel pay visits to build infrastructure and provide medical services, remains more active in Central America than in the rest of the hemisphere. HCA exercises operated at an unprecedented pace in the region in 1999 following Hurricane Mitch; while they fell off somewhat in 2000, the program increased again in 2001 following the El Salvador earthquakes. In Honduras, the Southern Command's "Joint Task Force Bravo" continues to operate out of the Soto Cano airbase near Comayagua. 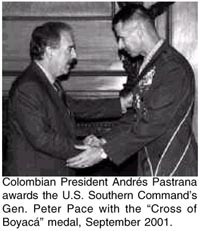 The unit's 550 U.S. military personnel and 650 U.S. and Honduran civilians provide "responsive helicopter support to missions in Latin America and the Caribbean," Southern Command chief Gen. Peter Pace explained in April 2001. Nicaragua and Guatemala are two of the only countries in the hemisphere that do not receive combat and technical training through the International Military Education and Training (IMET) program. Both countries are limited to "Expanded IMET," which offers courses in management, civil-military relations, human rights and related topics. In the Nicaraguan case this is a matter of policy, probably owing to the Nicaraguan army's Sandinista origins. Guatemala, however, is prohibited by law from receiving military aid through regular IMET and the FMF programs, due to persisting human rights concerns. The House Appropriations Committee urges "renewed emphasis on improving the Guatemalan civilian police force ... to strengthen law enforcement and modernization of the state." Anti-drug aid is expected to fuel increased military and police assistance to the Caribbean in 2001 and 2002, as the State Department's 2002 request for its International Narcotics Control (INC) program foresees large increases to the region. The Defense Department is funding many construction improvements to the U.S. Forward Operating Location on the islands of Aruba and Curacao in the Netherlands Antilles. $10.2 million will build new runways and other facilities for Aruba, which is used by U.S. Customs aircraft. Another $43.9 million will support similar upgrades at Curacao, which hosts a larger number of U.S. military planes. Construction will end in late 2002. 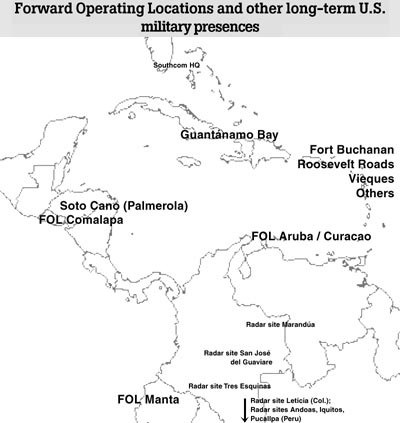 Rivaling Plan Colombia for controversy in the region is the U.S. Navy's continued use of a firing range (the Atlantic Fleet Weapons Training Facility) on the island of Vieques off the eastern coast of Puerto Rico. The site has been a focus of intense protest since April 1999, when a plane practicing bombing missed its target, killing a Puerto Rican civilian security guard. The Navy is currently practicing bombing on the site using inert concrete bombs; a non-binding referendum of Vieques residents in July 2001 found that 68 percent wanted the Navy to vacate the sixty-year-old site immediately. The firing range's future should be sealed by a binding referendum in November 2001 that does not include the Navy's immediate withdrawal as an option. Voters will choose either to allow the Navy to remain (and receive $50 million in economic assistance) or to force the Navy to leave in 2003 (and receive no funds). Language in the House of Representatives' version of the 2002 Defense Authorization bill would repeal this referendum and let the Navy decide whether it wants to leave the Vieques site. As this report goes to press following the September 11 terrorist attacks, policymakers are renewing calls to continue using the Vieques range while the Navy lacks available alternate sites. Haiti, which in the mid-1990s received a great deal of assistance to establish a national police force, today receives little police aid (Haiti has no army), due to prohibitions on assistance until "Haiti has held free and fair elections to seat a new parliament." Foreign aid legislation would allow aid for Haiti's Coast Guard; the Bush Administration's 2002 funding request to Congress asks for "resumption of FMF assistance to the HNP [Haitian National Police], and its Coast Guard in particular, mostly to enhance counternarcotics capabilities." The Dominican Republic will receive small amounts of FMF to support coastal patrol boats for counter-drug and migrant operations, and to provide tactical communications for military disaster-relief efforts. 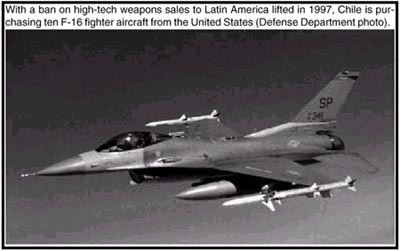 On June 13, 2001 the Pentagon formally notified Congress of the forthcoming sale of ten F-16 C/D series fighter planes and two KC-135 tanker aircraft to Chile. The planes do not include sophisticated AMRAAM missiles, as some had expected. The roughly $700 million sale is the first since a twenty-year-old policy banning high-tech weapons sales to Latin America was lifted in 1997. (One exception had been made in the early 1980s, when F-16s were sold to Venezuela.) Purchases by Chile and, potentially, by its Southern Cone neighbors have been slowed somewhat by the region's chronic economic crises. The New York Times reported in August that "Brasilia has set aside $700 million to buy up to 24 supersonic fighters. But it is insisting that any supplier provide advanced avionics and that Brazil's burgeoning aerospace industry be allowed to make the planes here for itself." The U.S. government may be uncomfortable with the level of technology transfer that these conditions would demand. Argentina, in the midst of a deep recession, has not announced plans to buy aircraft. Relations between the U.S. and Argentine armed forces are quite close, however, as Argentina is the only Latin American country to hold the largely symbolic status of "Major Non-NATO Ally" of the United States. This status has given Argentina priority access to the United States' program of giveaways of Excess Defense Articles (EDA). This program has provided Argentina with tens of millions of dollars in weapons and equipment over the past few years. The State Department's 2002 aid request states that EDA and a rapidly increasing amount of grant FMF assistance are aimed at strengthening the Argentine military's abiliy to participate in international peacekeeping missions. "Receipt of grant EDA helps Argentina obtain NATO-compatible equipment, such as transport and communications equipment, which improves its interoperability with NATO forces in peacekeeping operations." 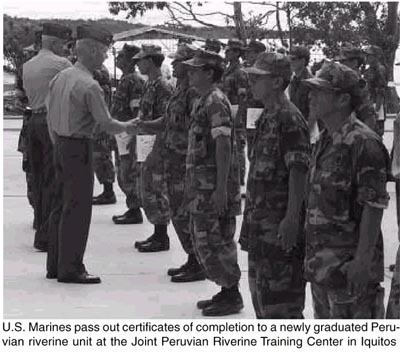 Though the most recent Foreign Military Training Report classified data necessary to make an exact determination, the launch of Plan Colombia and the training of entire battalons almost assuredly increased the number of Latin American military personnel trained in 2000 over the 12,923 reported in 1999. If patterns revealed by previous FMTRs continued in 2000, the majority of this training took place overseas, given by U.S. instructors (mainly Special Forces units) in the students' own countries. Though most of the attention of congressional oversight staff remains fixed on the standard foreign aid budget, the largest source of funding for training in Latin America is in fact the $300 billion Defense Department budget. Under an authorization normally referred to as "Section 1004," the Pentagon uses its counter-drug budget to train many more individuals than does IMET, the largest training program in the foreign aid budget. The best-known symbol of military training for Latin America underwent a makeover in late 2000 and early 2001. Following a change in the law proposed by the Pentagon, the Western Hemisphere Institute for Security Cooperation (WHINSEC) now occupies the building that housed the U.S. Army School of the Americas at Fort Benning, Georgia. The school, the only U.S. Army institution that offers training in Spanish, is in the midst of reforming its curriculum and removing several combat courses; the change in the law codifies several previously existing oversight mechanisms, such as a Board of Visitors and regular reports on the school's activities. Though its coursework is more intensive than that offered by most U.S. training teams overseas, the WHINSEC accounts for only about 5 percent of all Latin American military personnel trained by the United States. The Bush Administration's aid request for 2002 would revive Foreign Military Financing (FMF), a military aid program that had been used sparingly in Latin America during the past ten years. Primarily intended to provide military equipment for non-counternarcotics purposes, FMF levels in the hemisphere are expected to rise from about $4 million in 2000 to at least $18 million in 2002, with Argentina, Bolivia and El Salvador the largest beneficiaries. 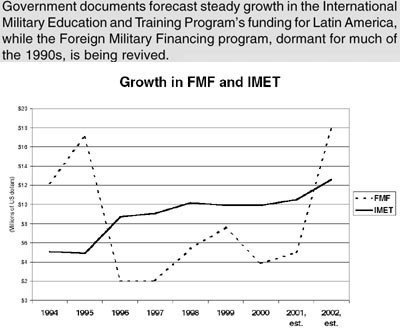 State Department documents also indicate that Latin America will share in a large expected worldwide increase in IMET funds for military training. The number of IMET-funded trainees from Latin America would increase by about one-quarter in two years, from 2,684 in 2000 to 3,399 in 2002. Latin America has accounted for roughly ten percent of the worldwide budget of the State Department's relatively small Anti-Terrorism Assistance (ATA) program, which provides weapons, equipment, services and training designed to help foreign governments prevent and deal with terrorist acts. 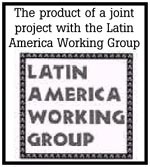 The State Department's April 2001 aid request indicated plans to increase ATA funding for Latin America significantly, from $3.0 million in 2000 to $4.4 million in 2002. In the wake of the September 11, 2001 tragedy in the United States, it is reasonable to expect the ATA account to increase sharply worldwide, including the Western Hemisphere. Indeed, the horrific attacks of September 11 have the potential to alter radically the United States' relationship with Latin America and its militaries. As this document goes to publication two weeks after the tragedy, it is easy to imagine that the U.S. military's main regional concerns during the 1990s -- the drug war, improving interoperability, developing new missions and carrying out engagement for its own sake -- have been eclipsed by a vastly more immediate threat to national security. While U.S. policymakers' attention may be diverted to the Middle East, it is unlikely that military and police assistance to Latin America and the Caribbean will decrease. In fact, what commentators are calling "America's new war" might bring increased involvement with the hemisphere's militaries, as the cold war did during the second half of the twentieth century. This new emphasis may bring several dramatic changes. First, the drug war may fall to secondary importance among U.S. military priorities in the region. This would be a tremendous change in Colombia, which is not only a key drug source country but is also home to groups on the State Department's list of international terrorist organizations. While U.S. Ambassador to Bogotá Anne Patterson recently told reporters "there is no stomach in the United States for counterinsurgency," there is some possibility that the purpose of aid could nonetheless shift toward helping Colombia to subdue "terrorist" groups within its borders. Secretary of State Colin Powell indicated that this shift may indeed be underway in a September 23 television interview: "Quite a few [terrorist groups] will go after our interests in the regions that they are located in and right here at home. And so we have to treat all of them as potentially having the capacity to affect us in a global way. Or to affect our friends and interests in other parts of the world. For example, we have designated three groups in Colombia alone as being terrorist organizations, and we are working with the Colombian Government to protect their democracy against the threat provided or presented by these terrorist organizations." In a context like Colombia's this mission would require a wholesale counterinsurgency strategy. Yet this strategy would carry the same risks of entanglement and human rights concerns as before. Should these risks and the policy's failure become reality, though, U.S. leaders may not be aware of the need to act, as their attention may remain fixed on the Middle East. A second change in U.S. policy toward the region could be a major rollback of controls and conditions on military assistance that have been put in place over the past twenty-five years. In a rush to build coalitions and to guard against this new threat, policymakers may come to view human rights, nonproliferation, and other protections -- as well as transparency mechanisms -- as obstacles. The Leahy law, limits on aid to countries developing nuclear weapons, prohibitions on aid to governments resulting from military coups, limits on CIA recruitment of known human rights abusers, and the ban on assassinations of leaders could all be challenged in coming months. Yet these protections are more badly needed now than ever. Assistance to known abusers and criminals may appear to offer security in the short term, but history has shown repeatedly that offering aid or a tacit "seal of approval" to those opposed to our core values -- human rights, liberty, democracy -- frequently contributes to making volatile regions even less secure in the long term. Countries and individuals must be held to an extremely high standard of relevance to U.S. security before existing protections are waived, and the idea of "blanket waivers" promises nothing but disastrous results. We must be cautious about reversing decades of building human rights protections into U.S. foreign policy. A third change in U.S. policy toward the region could be an acceleration in an existing trend of increased military involvement in foreign policymaking. Already, the many programs documented in this publication have given the U.S. military a high degree of influence in the Western Hemipshere. About 50,000 U.S. military personnel pass through the region in a typical year, many of them carrying out activities that count "engagement" as a chief mission. As a result, it is already an open question in many countries which part of the U.S. government -- the diplomats or the officers -- has the closest relationships with key leaders. A fourth potential change is a reduction in oversight of U.S. military programs. In the few weeks after the September 11 attacks, a Congress normally fraught with partisanship addressed all national security issues with near consensus. Once-controversial U.S. military programs like Colombia and Vieques dropped from sight. This current desire for unity is understandable. Nonetheless, oversight of U.S. military programs -- which is based on the "trust, but verify" concept -- unavoidably involves controversy at times. During the past five years, Congress had made good progress toward better oversight of U.S. training and counternarcotics programs with Latin America. Congress has required that the executive provide better information on foreign military training and Defense Department counter-drug expenditures, established a requirement for tracking the careers of certain foreign military personnel trained by the United States, and implemented the Leahy Law, prohibiting training and assistance to foreign units that commit human rights abuses. These are all significant improvements in oversight. But oversight is only possible when there is both access to information and a desire to analyze it. While information may still be produced, the desire to focus on it may diminish. In the months ahead, policymakers must recall that U.S. military programs in Latin America continue and that relinquishing oversight will not make us safer. Those actively pursing oversight and accountability need and deserve support. As the President and Congress move to take strong action against terrorist threats, they must recall some of the lessons of the past forty years' U.S. military involvement in Latin America. Probably the most important is to be careful in choosing our friends -- both those who we train and with whom we develop long-term alliances. We must choose allies who do not violate our sense of justice, human rights or democracy.